A little less than a decade ago, G.E.T. 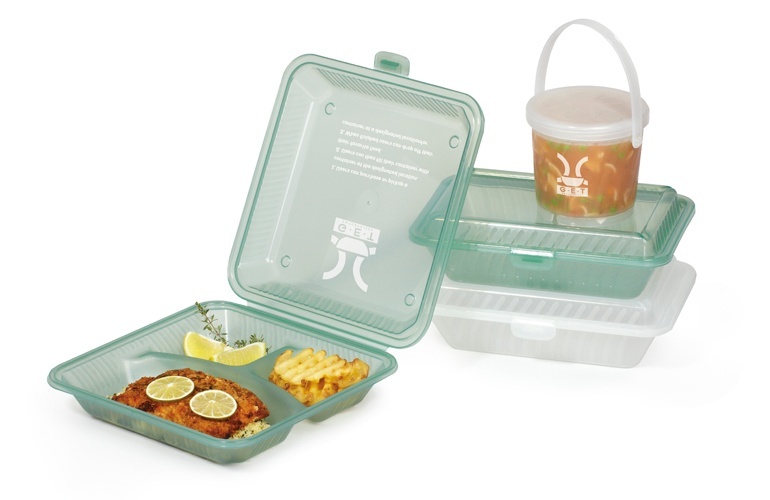 introduced an innovative line of reusable to-go containers, Eco-Takeouts®. Since then, plenty of colleges and universities around the country have found value in implementing an Eco-Takeouts® reusable program on their campuses because of the cost savings, reduced waste, and environmental friendliness over using disposable to-go containers. Secondary schools may find value in customization because it’s a great way to show school pride, act as a walking billboard for your school’s brand, and reinforce your Eco-Takeouts® program. Even better, you may be surprised by how many options you have, how affordable it can be, and how quickly some customization can be produced at G.E.T. You can add a custom logo, design, or color to any Eco-Takeouts® container. G.E.T. will even partner with you to help you find exactly what you’re looking for. Let’s break down the options, costs, and turnaround times of different customization applications so that you have everything you need to create a successful program. Single-color logos and designs are a popular customization option among foodservice operators because of the quick turnaround time, low Minimum Order Quantity (MOQ), and affordability. They also enjoy the advantage of an effective, simple way to elevate on-campus branding and promote the Eco-Takeouts® program. The setup fee is a flat rate that isn’t affected by order volume. As long a you meet the MOQ requirement of 12 dozen (a total of 144 containers), you can order as much or as little as you like, knowing your setup fee won’t change. Most of our college and university foodservice operators find the MOQ amount to be easy to manage. It allows them to order backups in small batches for replenishment purposes without having to worry about how to store a high-volume order of customized containers. Schools can easily recoup the customization cost by working it into an accountability model for their Eco-Takeouts® reusable to-go containers program. Another reason why college and university foodservice kitchens like the single-color option is because of the quick turnaround time. Here at G.E.T., we produce our single-color logos and designs in-house, which results in excellent fulfillment schedules. If you go this route, you can quickly, easily, and affordably add customization to your reusable containers at the volume that’s necessary for your foodservice operation. At the same time, your students can enjoy showing their school pride while you benefit from branded pieces visible around campus daily. You could even add a three-step logo reminding students how the program works, which may help to reduce the amount of containers that are lost. Some colleges and universities may want to add more detail to their logo or design than a single-color. Let’s explore multi-color options and what that model could mean for your school’s reusable to-go container program. The biggest difference between single- and multi-color customization is the production process, which impacts the cost and turnaround time. With single-color silk screening, the containers go through one pass on the machine, are dried, and then packed for shipping. For multi-color logos or designs, the process is more involved. Each color requires its own pass through the silk screening machine. Imagine printing something in color, but having to run the same piece of paper through the printer for each color you’re using instead of it printing all at once. That’s essentially what the multi-color process is, which naturally costs more in labor and takes longer to produce. The setup fee for multi-color is $175, just slightly more than for single-color. If you’re using three colors, your setup fee will be $525. It will be more expensive than a single-color logo or design, but the price will vary depending on how many colors you use, how many containers you’re ordering, and the complexity of the design. More elaborate designs with small details may take longer to produce, which would affect the turnaround time and overall cost. We have a team dedicated to helping you navigate the cost and turnaround time for multi-color customization. They’ll help you stay on track with your budgets and operational planning. Call 713-467-9394 to request a quote. Perhaps one of the simpler customization applications, custom colors on Eco-Takeouts® containers are an excellent choice for foodservice operators because there is no additional cost if you’re using an existing container design and meeting the MOQ, and students get to showcase their school pride! The reason there is no additional cost is because adding color during the manufacturing process only requires incorporating a food-safe pigment into the polypropylene, the material used to make Eco-Takeouts® reusable to-go containers. In other words, it doesn't change the process of creating the containers enough to increase the costs of manufacturing. You can pick a school color and have it applied to your whole Eco-Takeouts® container, but know that you’re limited to one color. Depending on the style you prefer, both transparent and opaque custom colors are available. You can also add a custom logo or design, in single- or multi-color, to Eco-Takeouts® to-go containers that have been made with a custom color. You’ll need to include the costs and MOQs for logos and designs discussed above, and also allow for extra turnaround time. This is because adding logos or designs is an additional process. The good news is that if you order toward the end of a school year, you’ll be ready to go in the fall with your new lineup of custom color Eco-Takeouts® reusable to-go containers, and you won’t incur extra cost! For a seamless ordering process, we recommend planning for the busy back-to-school season as early as possible. Giving your school plenty of time means you don't have to worry about custom orders getting backed up in the production process in August, which is a high-volume ordering time. Plan ahead if you can! We may be self-confessed tabletop nerds here at G.E.T., but we think the Eco-Takeouts® reusable to-go container program is a really exciting option for college and university kitchens because of the operational efficiencies, savings, and customization choices that come along with it. Customization is an excellent addition with enough options to help you stay within your budgets and manage the timing of your purchase while increasing school pride! We want you to have the best experience possible with your reusable to-go containers. 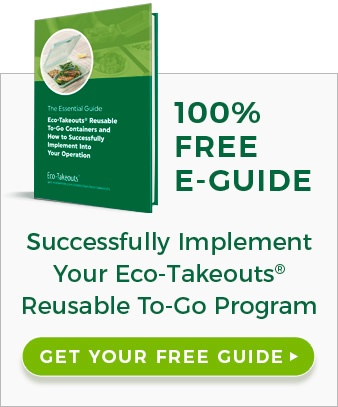 Check out our article "The Best way to Implement Eco-Takeouts® Reusable Food Containers" for great tips on how to launch an effective Eco-Takeouts® program.